Aloe vera can be taken both orally in juice form and topically in gel form. It has been shown to have health benefits and health consequences. There is controversy over the oral effects of aloe juice, especially when used by pregnant women. There is not enough scientific evidence to prove or refute health claims, so speak to a physician before starting oral supplementation with aloe. The use of aloe vera, also called Aloe barbadensis from the Liliaceae family, can be documented 3,500 years back to Egypt, though its use probably went back another few thousand years. It originated in the arid and hot environment of north-eastern Africa and Madagascar. It is a perennial succulent that is now cultivated in areas of the United States, Mexico and Asia. Aloe can be used in gel form when applied directly to the skin to combat itching and burning. As a juice, it has been taken orally to alleviate symptoms of asthma, diabetes, epilepsy and constipation. When dried, the leaves contain latex, which is a powerful laxative. Aloe also has blood sugar-lowering properties, so it may be recommended by a physician to those with Type II diabetes. Safe Alternative Medicine claims that aloe has beneficial effects on the immune system and that it reduces fevers and inhibits some viruses. It can alleviate heartburn and peptic ulcers. 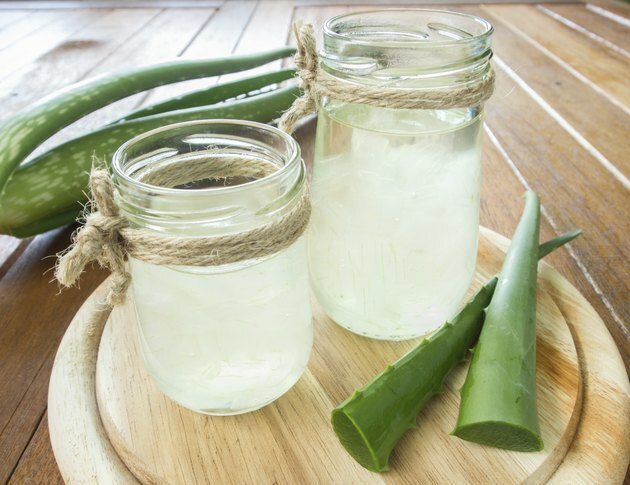 For adults, the typical dosage to maintain a soft stool is about 0.04 to 0.17 grams of dried aloe latex, or two tablespoons of aloe juice in a glass of water. For children under 18, please consult a physician, as aloe has been known to lower blood sugar. There have been cases of death associated with injecting aloe with a needle. The American Pregnancy association has deemed aloe juice possibly unsafe during pregnancy due to increased risk of uterine contractions and drops in blood sugar. Any laxative product made with aloe, such as those that contain aloin and barbaloin, can lower electrolyte levels. There are claims that small doses are safe and beneficial, but there is not enough scientific evidence to justify its usage. Aloe can be passed through breast milk to the baby, and is considered too harsh on the baby’s digestive system. It can cause vomiting, constipation and diarrhea. Unless recommended by a physician, its best to avoid aloe juice during pregnancy and breastfeeding. According to the National Institutes of Health, aloe can cause cramping and diarrhea. Using aloe for constipation for at least seven consecutive days may lead to dependency, so avoid prolonged use. Using aloe for over a year has been shown to increase risk of colorectal cancers. There have been reports of liver inflammation with high dosages of aloe. The laxative effect may cause electrolyte imbalances, which can lead to muscle weakness and abnormal heart rhythms. People with diabetes, heart disease, kidney disease, thyroid disorders, and electrolyte imbalances are urged to speak with a physician about the effects of aloe before using.